T.E. 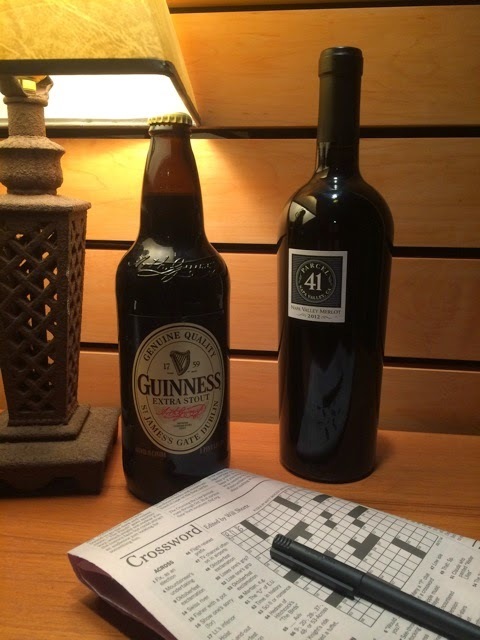 Woods is guest posting today on Drinks with Reads matching her new book, The Unforgivable Fix with Wine and Guinness. You'll have to read on to see if she suggests mixing them together. Mort Grant is Chief of Detectives for the Seattle Police Department. Lydia Corriger is a clinical psychologist in Olympia, Washington. Their paths crossed a couple of books ago in a way I could explain, but then I’d have to…well, you know the rest. It would be far less messy and you’d have much more fun if you simply picked up “The Fixer” and started at the beginning. They’re an unlikely pair. Mort’s a what-you-see-is-what-you-get kind of guy. He’s got a small circle of friends he’d walk in front of an oncoming locomotive to protect. He likes basketball, loves his family, and would do tricks for a slice of double-spiced pumpkin pie from Annie’s Diner. Lydia’s an intellectual loner. Her patients intrigue her, but professional relationships are the only social contact she indulges. She’s built a secure and solitary life on a cliff high above Puget Sound. She sidesteps any question that threatens to reveal the slightest thing about her, reads four newspapers daily, surrounds herself with the beauty of the birds and the sea, and dines amid original art every night at a table set for one. Yes, they’re an unlikely team, our Mort and Lydia…but a secret binds them together tighter than any bloodline or romantic passion could. Together they solve crimes. The most heinous of crimes. The crimes that in the telling march you to the edge of what cruelties the human mind is able to conjure…and then compels you to look. You’ll never wonder why they drink. For Mort, it’s Guinness stout. As the legend goes, the best Guinness is the one shared with friends, and so it is with our detective. He’ll have a bottle in his hand when Jimmy and Micki, his best cops, bring pizza to his place to watch the Seattle Wings take on the NBA. He’ll share one with Robbie, his journalist son always itching to pick his dad’s brain for the latest inside crime info. And keeping him sane is the bottle he shares on Thursday with L. Jackson Clark, the Nobel Laureate philosopher with whom Mort’s been working the New York Times crossword puzzle once a week since Jesus was twelve. Lydia’s drink is a room temperature Merlot. The full bodied warmth of the heavy red wine helps pull the burden of a days’ worth of her patients’ agony away from her own wounded soul. She sits on her deck, breathes in the wine’s spicy aroma, and sips as the sun sets behind the mountains. She drinks alone. One glass an evening and only the best. Her side job lets her afford it. Ah, but that’s another story. Who are you? Are you a Mort who enjoys a pull of stout while laughing with friends? Or are you a Lydia, sipping perfection in isolated quiet? Either way, pour yourself a glass and settle in for an evening with Mort and Lydia’s latest adventure, “The Unforgiveable Fix”. We'll be back next Friday with a fabulous read and a matching drink recipe. I'm Lydia all the way. They sound like a very interesting pair, great book for my TBR pile!